Ginny Messina, The Vegan R.D. New research from Canada found that kids who don’t drink cow’s milk are shorter than those who do. It’s a finding that makes for some sensational headlines but the study itself is not all that exciting. This was a cross-sectional study of 5,034 children between the ages of two and six years (average age was about three years). Of the study population, 246 kids, or about 5% of the subjects, drank only non-cow’s milk, which included plant milks and goat’s milk. For each daily cup of non-cow’s milk consumed, children were 0.16 inch shorter. 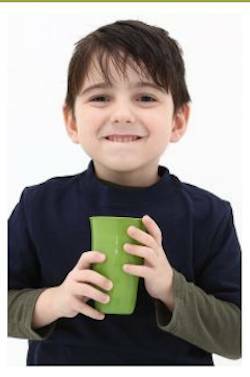 By age three, those who drank three cups of non-cow’s milk per day were about 0.6 inches shorter than children who drank an equivalent amount of cow’s milk, but this finding wasn’t statistically significant. Since cross-sectional studies look at relationships only at a single point in time, they are generally weak types of evidence. And this particular study provided no additional information about the diets of these children. It also didn’t differentiate among types of non-cow’s milk. These are two crucial factors, especially because the researchers suggested that the differences in height may have been due to differences in protein intake. Both overall diet and type of plant milk consumed would have a very big effect on how much protein these children were getting. A toddler drinking three cups per day of almond milk will likely have a much lower protein intake than one consuming three cups of soymilk. This is one reason why vegan nutrition experts recommend soymilk as the best option when kids are being weaned from breast milk or infant formula. This study would have provided more relevant information if it had compared children drinking cow’s milk to those drinking soymilk. Overall, these findings suggest that type of milk consumed may impact childhood growth, but it’s not possible to determine this without looking at milk consumption within the context of the whole diet. More importantly, there is no evidence that cow’s milk has advantages over other protein-rich milks like soymilk or protein-fortified plant milks for kids or anyone else. Source: Morency M, Birken CS Gerald Lebovic G et al. Association between noncow milk beverage consumption and childhood height. Am J Clin Nutr 2017; Epub ahead of print.